Barbadian writer Dr. Karen Lord is a case study author in one of the research strands in Caribbean Literary Heritage that examines authors’ relationships to their papers (as materials related to their work), literary archives, and the role of social and digital media in shaping changes to record-keeping practices. There is a particular focus on how these may inform creative processes and whether such practices may change over time and through the course of authors’ careers. I first met Karen in a café in Manchester, the summer of 2017, after she had just arrived from hosting the Hugo Award Ceremony for Worldcon 75 in Helsinki. Our conversation then continued in Bridgetown a few months later. Karen’s generous reflections and sharing of her own interest and practice regarding the organising and looking after of her papers, has fuelled this research and opened new paths of investigation. Among these are the simultaneous fragility and versatility of digital formats and the significance of documenting the changing nature of the publishing industry, particularly for emerging and future generations of writers. Lord’s first novel, Redemption in Indigo, is based on a West African folk tale, where characters such as Anancy, also present in Caribbean folklore, bridge literary traditions of the diaspora. Redemption won the 2008 Frank Collymore Literary award for best-unpublished manuscript and was longlisted for the 2011 OCM Bocas Prize. The novel also won the 2010 Carl Brandon Society Parallax Award, the 2011 Crawford Award, the 2011 Mythopoeic Award, and the 2012 Kitschies Golden Tentacle Award for the Best Debut Novel. The Best of All Possible Worlds, was awarded the Frank Collymore award in 2009. The following selection of questions has been excerpted from both interviews with Karen Lord. 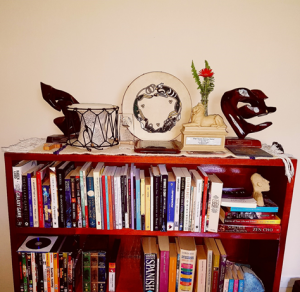 From left to right: 2009 Frank Collymore Award; 2010 Carl Brandon Society Parallax Award; 2011 Crawford Fantasy Award; 2011 Mythopoeic Fantasy Award; 2008 Frank Collymore Award. MF: Thank you for meeting with me and discussing your work, Karen. How did you first become interested in, and involved in, recording and future-proofing your papers? KL: There was a stage when I was travelling a lot because of my doctoral studies. I needed to keep many paper references and I was working on manuscript drafts. Then I stopped doing that as it was too much to carry, and I started working almost exclusively digitally. There were very few publishers that you would still submit to paper-wise, and now almost all communication is by email. As a result, I did have a very keen concern of what happens when formats change. What had me beginning to think seriously about all this was a request from Texas A&M University to have my work as part of their archives. I hadn’t really considered it previously. I suppose I had a vague sense of my papers but I had not thought that far ahead. 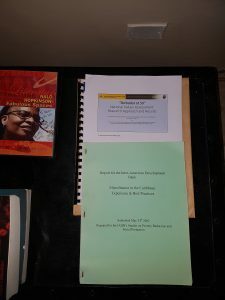 Then there was another request in 2016 when Nalo Hopkinson, – a fellow Sci-Fi and fantasy writer from Jamaica and a professor at the University of California, Riverside – invited us [a group of Caribbean writers] to a seminar and encouraged us to share our materials with the archivists at the Eaton Collection [one of the most prestigious collections of Sci-fi writing]. I took a few documents up with me. They were mostly interested in juvenilia, early stories and essays. 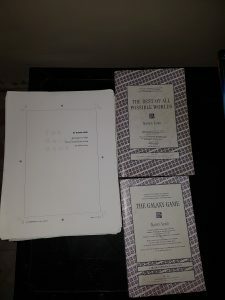 I handed over an undergraduate essay on George Lamming’s The Castle of my Skin and an analysis of a fantasy novel. There were some very eclectic records, nothing like drafts, manuscripts or related to anything published. It was more things that I had saved for sentiment and were not in my computer. They were rolled-up in storage, and I thought to myself: ‘they’re probably safer in a library right now’. I think that my education, in that sense, really started when I began speaking with archivists at the Eaton Collection, because I was trying to figure out what to bring and I would say: ‘I have this, I don’t know if this is any use …’ and the archivist would say: ‘you know, this is useful for us’ and that changed my thinking a bit on what was worth saving. Now, I am trying to be more mindful when I travel, to not travel as light anymore and to pick up those books, documents and programs as part of the record. For example, one of the things that I brought with me this time is the Hugo ceremony script with my handwritten notes. This was the second biggest Worldcon ever and I was the Toastmistress, so that is something that should be in my library. That would have been lost before – I’m telling you straight up. I would have just thrown that out. I think where I am at right now is seeking good practice, seeking good basic understanding of how to organise a library, and being mindful of what could be added to the collection. MF: What are the types of documents that you now consider part of your papers? KL: Well, I do have a much broader sense of things now. As well as documents like drafts, manuscripts or notebooks, I also consider materials from literary festivals, conventions or conferences that I attend – especially if I am getting signed copies of work by my colleagues and friends, things like the badges you’re given; scripts of ceremonies you’re involved in; photos – official photos, of course, but sometimes also professional-level photos that colleagues share on Facebook or Twitter. Documents like my contracts, and others that interest me in my particular field, particularly regional anthologies of collections with specific themes. I would even say podcasts. I think of all these as part of my professional collection. I did a podcast series, SF: Crossing the Gulf, with colleague and friend Karen Burnham that ran for a little more than a year, and it paid off when Professor Jane Bryce was delivering a Frank Collymore address and made reference to one of the podcasts. I then thought ‘If that is a matter of record, I have to think about what is preserved.’ She referenced, of course, a link to the website but then a couple of years afterwards the website SF Signal ceased to be in operation and was no longer hosting the audio. We fortunately found another website that could host it, Locus Magazine; a national print publication, which also has web presses. Now, I can also point people to Locus on my own website as to how to find the audio, because the old website only has the descriptions; it doesn’t have the audio at all. That was a sobering experience as more than a year worth of podcasts had disappeared and we were not sure how to get it back online. You know, you have a book and it lasts for decades, but you have something like a digital file, especially something which you don’t have total control over the content, and it can disappear, so I became a bit more mindful at that point. It’s a bit of a paradox when on the one hand you have to be really cautious about things that are digital, but on the other hand, they can be your best bet for making sure you recover something suddenly lost in disaster. 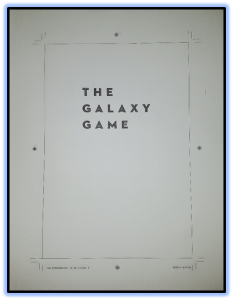 You see a single book, a single microfiche, can disappear forever whilst several copies of something virtual can be tracked down and restored. I think it’s a question of being very careful, and purposeful in what you do and recognising the strengths and weaknesses of each format. MF: Have changes in digital technology or media shaped your own work of record keeping? KL: I’m definitely paying a lot more attention to the big files. Text files are very little in comparison. Now I’m having to consider things like saving audio for podcasts, or saving video from an interview, a trailer or a performance, and it has made me a little more mindful about budgeting for something that includes larger storage space and not smaller. Also, what I have sometimes done is: if there is a review somewhere on the web, I’d print it out. That’s what I used to do for my first book when it was all new and shiny, and I wanted to have all the reviews. And I’m glad I did because with some of them, once you go back to the link, the publication is no longer there; the links aren’t operative. So the print out that I have is now my only record of that particular review. The very first review that I ever got for Redemption is an example of that. I still ‘follow’ the person who did the review on Twitter, so I could always write and say “could you share that with me for my own records?” I did print it out, and I’m glad for that. However, I didn’t think I would’ve had to. MF: How about the role of social media today, in regards to writers and the writing process? KL: What I try to do, from my point of view, is to recognise the utility of all the connections made possible through social media. I am talking about the basic problem with Facebook and Twitter of writers getting distracted from writing. So you have to be careful with it. Also, publishers now want you to have a social media platform even before you publish. They want to know if you have a Twitter account, if you have a Facebook, if you have a Tumblr. If you have a website, how often do you update your blog? These become things authors feel they have to do. I have to set the boundaries of what I’m willing to do in terms of promotion and publicity. I know what I can and cannot do, and what I’m willing and not willing to do. KL: I think that festivals are essential. Of the ones that I have been to in the region, I’ve been struck by how each of them has a particular strength. They all do things differently, but what is common is that they all engage the community. At Calabash Festival (Jamaica), I was amazed to see the extent to which people engaged with the festival. Festivals such as Bim Lit Fest (Barbados) and NGC Bocas Lit Fest (Trinidad) make sure that children, students and young people are involved. Literary festivals in the Caribbean also include other forms of art, so you also get a little bit of film, a little bit of music and other kinds of performance. I like that, because we tend to have strict boundaries for our art, so having those other media being represented is also very important. When you travel to festivals, you also see familiar faces. Every time I have seen Kei Miller, for example, is at some kind of festival. I look forward to it now. I mean, it’s always a packed time but I know we’re going to find a moment to have some amazing conversations even if it’s while we’re waiting for the bus. The writers, the elderly, and the young people that I’ve met at festivals, we all have these important conversations that take months to unpack. It is important because people talk about writing as being a very solitary occupation, but festivals are where we get to talk to the people who are also working on this. We talk about the industry, we talk about our ideas, and we talk about who’s coming out next and what we can do to make things better for them and ourselves, and it really wakes up the brain. It gives you inspiration not just in the sense of ‘oh, this is what I want to write about next’, but more in the sense of this is how I will structure my work, this is how I will approach my career. To me, festivals and conferences are very multi-level events. I don’t think anyone has ever properly grasped and assessed the value that they add to the creative industries as a whole, but to me they are irreplaceable. 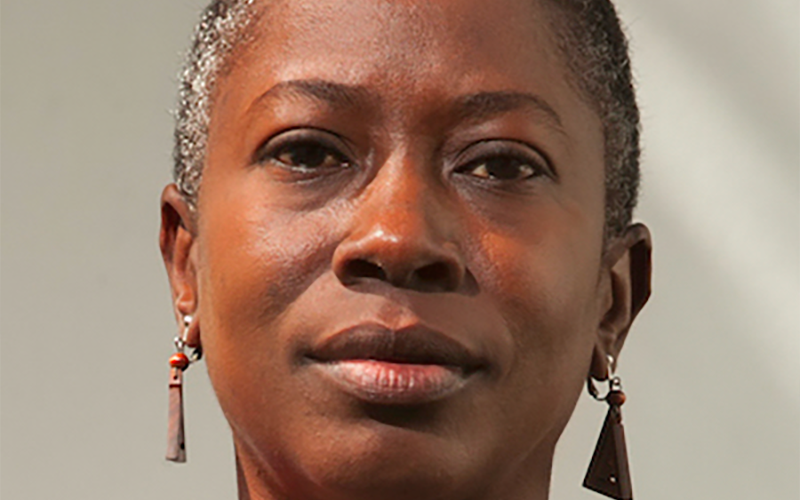 Barbadian author and research consultant Karen Lord is known for her debut novel Redemption in Indigo, which won the 2008 Frank Collymore Literary Award, the 2010 Carl Brandon Parallax Award, the 2011 William L. Crawford Award, the 2011 Mythopoeic Fantasy Award for Adult Literature and the 2012 Kitschies Golden Tentacle (Best Debut), and was nominated for the 2011 World Fantasy Award for Best Novel. She is the author of the science fiction duology The Best of All Possible Worlds and The Galaxy Game, and the editor of the anthology New Worlds, Old Ways: Speculative Tales from the Caribbean. She is part of the writing team for seasons three and four of the serial fiction Tremontaine. Caribbean Literary Heritage: who matters and who cares? | KwK Media on Caribbean Literary Heritage: who matters and who cares? Caribbean Literary Heritage is a project funded by the Leverhulme Trust that promotes literary and archival preservation in the Caribbean and the diaspora, as well as bridging connections between the literary past and present with an interest in exploring the new challenges and possibilities of born digital initiatives.